CRTC, Inc. - Because Life Is Not A Rehearsal! This class is designed for advanced operations in deploying and executing tactical operations for both SWAT and advanced level patrol officers. This is not a beginning level course. Law Enforcement and Military Only. In an effort to prevent sensitive training from reaching the wrong audience, Cooley limits certain classes to active military and law enforcement officers, with identification being required. On the civilian side, CRTC offers basic through advanced training in Personal Armed Self Defense, Unarmed Self Defense, as well as Home Security. 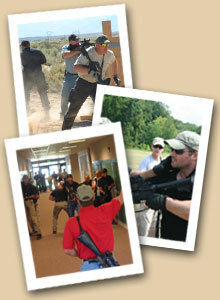 Competitive shooters may take advantage of Cooley's 3-Gun Competition, Long-Range Sniper and USPSA Handgun Training. All CRTC's classes are designed to provide the highest quality personal training at your location. CRTC brings Cooley's instruction to you, saving thousands of dollars in travel expenditures and lost time. If you are interested in sponsoring a course in your area, please contact our office at (208) 270-0309 or send us an email with this form. CRTC, Inc. ©2006 All Rights Reserved.